So you want to grow your own garden, but you think you don’t have enough time or space in your yard to do it. Nourishmat, an easy-to-use garden grid, allows you to grow your own vegetables, herbs, and flowers in little time and space, and it requires very little effort. The four-by-six-foot Nourishmat is pre-cut and labeled so that you don’t have to do it. It embraces bio-diversity with 19 different plant varieties, selected for their compatibility, that can be grown on the same mat. 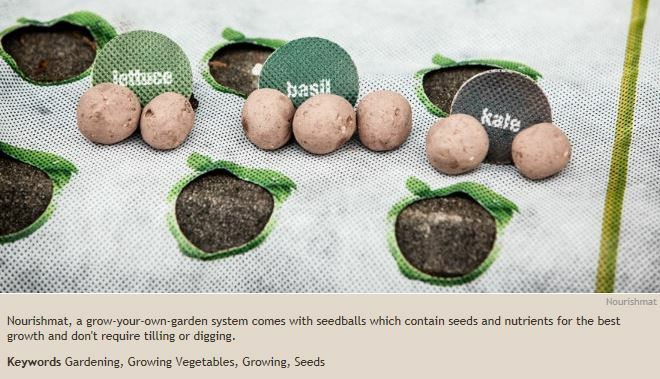 The reusable mat comes with 82 seedballs — clay and compost mixtures that contain seeds and protect them from harsh environments and pests — a planting guide that tells you where and when to plant them, and an optional built-in irrigation system. With pre-planted seeds, there’s no need for digging or tilling. Growing an herb garden is just as easy. The two-by-six-foot Herbmat is based on the same garden system as the Nourishmat. This mat comes with 32 seedballs for planting eight herb varieties. With these inexpensive gardening systems, you can eat healthy without worrying about where the food came from or if it contains genetically modified ingredients. Not to mention you get the personal satisfaction from growing it yourself. Both gardening systems are being funded on Kickstarter with a goal of $70,000. Organic vegetable gardening is becoming more popular with each passing year, as home gardeners strive to grow gardens that are bountiful, healthy, and ecologically friendly. Starting an organic vegetable garden is fairly straightforward; here’s what you need to know to get started. Sun: You want a site that offers as much direct sunlight as possible — at least 6 hours, and preferably 8, during your main growing season. If you don’t have a space available that offers that much sun, don’t despair — there are crops you can grow without full sun. Terrain: Does the land slope? You’ll want to orient your garden bed to take full advantage of the sun exposure. Is there a depression where water collects? You’ll want to think about filling this in with good soil so it doesn’t stay soggy — a site like that will take much longer to dry out in spring, and could result in rotted plant roots during the growing season. Wind: Is the site at the mercy of high winds? If you live in a windy area, consider trying to position your garden in a place that has a hedge, wall, or other structure nearby to reduce the effect of high winds. If you don’t already have some type of windbreak in place, consider erecting strong trellises nearby to serve this purpose. Access to water, tools, compost. You don’t want to have to drag tools from the other end of your yard, and toting a watering can around isn’t much fun, either. Make it easy on yourself, and try to situate your vegetable garden bed in a convenient place. How is the soil in your potential veggie garden area? Is it rocky and full of tree roots? You may want to consider building a raised bed vegetable garden or lasagna garden. If not, then you could go ahead and double-dig the existing soil and try to grow there. Either way, it’s important to assess your existing soil to see what you need to do to make it perfect for growing organic vegetables. Get Your Soil Tested: You can send samples of your soil to your local cooperative extension service for testing. Some garden centers and nurseries also offer soil testing services. This will let you know which nutrients are deficient in your soil and what type of soil you have, as well as provide suggestions for how to improve your soil. Do a Quick D.I.Y. Soil Test: By doing a few simple tests yourself, you can learn a lot about your soil. Learn about what type of soil you have, how healthy it is, how well it drains, and test its Ph — all very useful information! Follow the instructions you get back with your soil test in regards to any nutrient deficiencies or Ph level issues. If you find that you have clay soil, there are some straightforward ways to improve it. Sandy soils benefit from the addition of plenty of organic matter, specifically, lots of compost. Now that you’ve got the garden sited and the soil amended, the organic plants and seeds bought — now it’s time to plant and tend your garden. Look up information on the types of vegetables you want to grow to ensure that you’re providing them with the right amount of water and nutrients. Consider doing some companion planting for a healthier garden. Pay close attention to your garden so that you catch pest and disease problems right away. The biggest part of growing a healthy garden is simply paying attention. If you do that, you’re well on your way to a healthy, bountiful, organic vegetable garden.